If your partner is a Sagittarius, love is a big adventure. Sagittarius people are restless, philosophical and always seeking something; they need partners who will join their quest gladly. Sagittarius could be your soulmate if you’re seeking excitement and if you’re not bothered about settling down. When the ruler of a particular sign is a big, imposing planet, as is the case with Sagittarius, it is obvious that they are positioned for big things. Since Jupiter, the largest of all the planets, is the planetary ruler of Sagittarius the most conspicuous quality that they will possess is “bigness”. It may sound silly but it truth this characteristic can be profoundly manifested in lots of aspects of your Sagittarian lover. Big Hearts, Big Heads, Big Games, Big Contradictions, these are all parts of the expansive nature of all the Sagittarians in our life. They dream in Technicolor and play on super sized jungle gym, and though they are sometimes unaware of the respect and loyalty that they command, we all know it and we can see it throughout our relationships with them. If you have a Sagittarius in your life it may be important to note which of the bed rocks your friend/lover stands more securely on. If they are of the intellectual persuasion their logical (Jupiter) nature will make them a formidable foe to argue against. Their arguments are usually well informed and beautifully constructed. Let them talk and if you disagree, wait till you see holes in their argument since a logical flaw will be most likely to induce reevaluation of their point of view. With the sportsman out there, just avoid physical competition. If they lose whatever game is being played they will hate it because they are perhaps a bit too competitive. They are usually the dirtiest, and most beat up at the end of whatever they are doing. Encourage, as their friend/lover, less result oriented physical endeavors. Sagittarians are insecure and can be frustrated easily with details, social conventions and the general niceties of day-to-day existence. This means that your lover may tend to hide behind a penchant for debate, concealing their fears and lack of grace behind a facade of verbal warfare. This can be tempered by good life experience that teaches them to be proud of who they are, or the natural loudness and intensity of personality can ostracize them from more conventional social scenes. The animal side of the centaur – innocent, playful and physically focused, blends well with the bull’s peaceful, affectionate and sensual nature. They’re both honest and fundamentally simple souls, and can have a lot of fun together – some of the time. But the fiery speed that drives Sagittarius can hit a brick wall of stubborn earth when Taurus and Sag clash, which may be often. Sagittarius needs to be on the move, ever seeking to expand their knowledge and experience - they approach life as an adventure to be faced with daring optimism. Taurus needs to create security that is deeply rooted in the fertile soil of the material world - they approach life with a cautious respect for the power of tangible assets. These include a committed life partner, and a Taurus in love pulls out all the stops. Without supportive placements elsewhere in their charts, however, the sensuous, secure, loyal, strong, supportive and homey charms the bull puts into play may be better saved for one whose values and temperament resonate more harmoniously. One area where these two blend well is in the realm of business. Sag flies under the fortunate rays of Jupiter, and brings ‘lucky’ gifts for expansive vision, enthusiasm and flair to the Venusian blessings and powerful money mind of Taurus. The perfect blend of optimism and caution can make for a killer team that brings out the best in both of them. In personal, intimate relationships, a strong spiritual connection and excellent communication is called for, if they want to make a go of it. You never want to say never, but these two are miles apart in their very essence. There’s a lack of sensitivity that can hurt too deep and too often for a relationship to be long lasting. This can lead to insurmountable problems. With enough compatibility elsewhere in their charts, these differences can be overcome, but a lot of communication and spiritual connection is called for. Opposite ends of the same axis, these two have a very great deal in common. Gemini seeks to see and know everything, while Sagittarius seeks to understand everything. They are the lighthearted way-farers of the zodiac, on a perpetual quest that they’ll share with unabashed enthusiasm. With the Sagittarius optimism and Gemini’s adventurous spirit, life presents infinite possibilities. There is an easy communication between them, not only verbally, but on more subtle wave-lengths. They will be ideal traveling companions and share a love of culture, as in theater, art, music - it’s a winning formula. They may feel surprised at the ease and freedom they experience with each other, as both signs resist limitation and are likely used to other love interests seeking to control or smother them in some way. Both these people need their space. Even in a marriage, the expansiveness and relaxed attitudes they have around this issue helps keep them together. Sagittarius will invariably be the leader in this relationship, providing guidance and wisdom to help Gemini in their confused or overwhelming moments. Ruled by Jupiter, Sagittarius has an inherent optimism and buoyancy of spirit that they’ll share with Gemini, who can get lost in moody mind trips. Gemini’s light hearted curiosity, razor sharp mind and playful approach to life feed Sag’s fiery passion to explore and expand. These two relate in a way that feels natural, life enhancing and exciting. Both need a lot of personal space, to be recognized as individuals and a lot of freedom of expression. This is a good basis for a relationship to grow. The other main ingredient needed for love success is an open hearted way of communicating and trust. Opposites can attract and complement each other - however, there are problems with communication between these two and the possibility of many misunderstandings. Sagittarius seeks knowledge, adventure and new horizons; they are born to roam, both literally and in the realm of ideas. Cancer loves to learn and travel, but they are primarily focused inwardly and don’t take well to the gypsy lifestyle. One quest these two will surely share, however, is for spiritual understanding. Optimistic and expansive by nature, Sag can help Cancer lighten up and come out of their shell, if Cancer trusts them enough to do so. Cancer can help ground Sagittarius, providing the stability and practicality the centaur often needs – so long as Sag doesn’t feel tethered. Creatures of many moods, Cancer can be extremely funny when the moon is right, and at such times these two will delight each other. Sag knows how to laugh, and they’ll do well to remember how good it feels to connect on this level. If they learn how to effectively relate to each other they can evolve, but there’s a need to love unconditionally – harder than it seems. When hurt, the crab crawls back into their shell, or healing place, until they feel strong enough to face the world again. The centaur tries to make it up, but, the more they say the worse it gets. If they’re lucky, they’ll see the funny side of it - maybe. With compatible contacts elsewhere in their charts this match can work, but each will need to make concessions and learn to understand their partner, which may be a challenge. A strong foundation in friendship is advised if an intimate relationship is what is desired. A dynamic pair with loads of presence; these two make a real statement when they walk into a room! Ruled by the life giving Sun and fortunate Jupiter, both of these two fire signs radiate positive, expansive and high energy vibes. They’ll find each other exciting and inspiring, and are naturally attracted by each other’s charisma, up-beat charm and physical presence. Their essential compatibility supports a harmonious rhythm; both Leo and Sag are outgoing and ambitious, and will enjoy being active in the outdoors, exploring cultural pursuits or the social scene. They share a sense of social responsibility, Sag seeking Truth and Justice and Leo courageously defending the needy and protecting the helpless. They both know how to enjoy life – their enthusiasm is contagious. Leo is drawn to Sag’s special blend of wildness and wisdom – Sagittarius can be funny, friendly, philosophical, and emit a powerful animal magnetism all at the same time. Though it’s hard to tame the free Sagittarius spirit, Leo’s graceful dignity, talent and languid, feline sensuality are enough to captivate the fast moving centaur and command their full attention like few others can. Though some potential conflicts exist, these two have the capacity to bring out the best in each other and can rise to heights of happiness and exhilaration. This is a compatible combo - they fit like a glove. Their fiery natures may spawn some energetic competition, but they can both emerge winners when they realize the potential gold medal this relationship represents. Although an inherently stressful dynamic exists between these two, each brings essential and complimentary energies that make life richer for both of them. Sagittarius seeks understanding of the Great Truths of life, and this quest for knowledge resonates with Virgo’s intense drive for personal transformation and evolution. Together they can find enormous fulfillment exploring the mysteries of both the inner and outer worlds that fascinate them both. Sag helps Virgo loosen up and venture out of their habitual comfort zone, while Virgo can provide Sagittarius with essential lessons in the virtues of thoughtful planning, protocol and diplomacy. Virgo understands the value of accurate and effective communication, whereas Sag often forges ahead without thinking, trusting their impulses when a more intentional approach would serve them (and those around them) better. Virgo will thrill to the Sag sense of adventure, and Sag will benefit equally from Virgo’s intelligent guidance and strategic approach to life. Virgo is naturally attracted to Sag’s fiery passion and spirit. Sag can find Virgo’s refined, beautiful earthiness a stabilizing influence that helps them to realize their dreams more effectively. Recognizing and appreciating each other’s personal differences by working together and harmonizing their skills is a winning formula. This can be a very supportive union with terrific potential. It’s a magical connection on many levels; sexually this combination can be very exciting and together they can really expand each other’s world in meaningful ways. Sag can find a peaceful center with Virgo that helps them to make their big dreams a reality, while Virgo feels set free, living life on a larger scale than they previously had. With supportive placements elsewhere in their charts, the considerable differences between these two can combine into a powerful, transformative relationship for them both. Influenced by expansive, fortunate Jupiter (Sagittarius) and Venus, the giver of beauty and pleasure (Libra) - these signs complement each other extremely well. Both are fundamentally positive, optimistic and forward looking in their approach to life. These two know how to have a good time and will never tire of each other’s company or conversation. They share important core values; justice, truth, the betterment of mankind and the planet strike deep cords in both their hearts. Joining forces to campaign for a social cause would bring considerable fulfillment - they’re both so communicative and outgoing and they enhance each other’s experience. They challenge each other with knowledge, having discussions that stretch their minds. As compatible as they are, their styles are decidedly different. Libra is instinctively attuned to the desires and sensitivities of others – they are diplomatic, gentle and aim to please. Sagittarius burns with a fast, hot fire that acts or speaks first and thinks later. They’ll blurt out whatever they’re thinking or feeling in what may be awkward or (unintentionally) hurtful ways. Libra is all poise and grace while Sag can be innocently clumsy as they get caught up in their enthusiasm for the moment. Both these two are social creatures and like to be busy and on the move. Libra wows Sag with their magic spell of charm, tenderness, fine mind and generous spirit. Sagittarius attracts Libra with their fiery exuberance, humor, high minded intelligence and idealism. Love and work are balanced, but the status-quo can become too comfortable - room for change and growth is a necessary part of life and the life-blood for Sag. These two communicate well, however, and can navigate challenges that arise, making this a perfect match. Revealing love lessons. Both signs are truth-seekers, searching for knowledge and the Meaning Of Life. They’ll connect on this level, although they are extremely different. Scorpio’s dark intensity seeks to plumb the depths in a fundamentally emotional sense. As a fire sign, Sag burns with inspiration and they engage the world through outer activity. Sagittarius teaches Scorpio via their freedom, optimism and open nature that after penetrating seriousness, the next step on the path is playful expansion. Sag holds nothing back - they’re an open book - whereas Scorpio reveals itself very strategically. Where Sag trusts, Scorpio suspects. Sagittarius can help Scorpio to come out of their shell, lighten up and have fun, which Scorpio needs. With Scorpio, Sagittarius must really make the effort to think before they speak - not always easy for Sag. They often blurt out the first thing that comes into their mind, offending or wounding Scorpio, who may sting in retaliation or retreat in silence. Scorpio can help Sagittarius to focus, take the time to look more deeply, and tap into their deeper emotional selves. Sag’s fire can feel put out by the heavy waters of Scorpio, and Scorpio can feel the life sucked out of them by the relentless fire of Sagittarius. Without supportive placements elsewhere in their charts, the considerable friction between these two personalities may prove difficult to overcome. Sag is open and honest, and without thinking they are doing anything wrong, will share some personal details of Scorpio’s life with others. Some may not react so strongly, but Scorpio needs respect and guards their privacy. If you’re going to try and make this union work, you better make sure there’s a lot of love and understanding, as well as a big capacity to forgive and forget. This is not a trait that comes easily to Scorpio. If both parties are willing, there are many lessons to be learned. Buckle your seat belts! Super-sized, ‘lucky star’ Jupiter fills these two with fiery, optimistic faith and an insatiable appetite for experience. Known for both their humor and sagacity, Sagittarius has a special blend of wildness and wisdom. They can be gypsies and gamblers, attorneys and athletes, performers, priests, the life of the party or studious anthropologists - but however their energy expresses itself, it will be fueled by high octane enthusiasm and an inner conviction that life will lead them to the pot of gold at the end of the rainbow. These two will join forces with a vengeance, sharing their interests in spirituality, ethics, philosophy, travel, the arts and their deep love of nature and animals with passionate abandon. They are seekers of Truth, who may spar on occasion as they let their verbal arrows fly with a blunt directness. Challenging each other and urging each other on with support, they live life in the fast lane, growing, exploring, laughing and loving. These two may have some bumps along their road, but they will adore the journey and each other. Sag can resist commitment, especially when they’re younger, but when ‘the one’ comes along they recognize it - eventually. They’ll respect each other’s need for personal space, happy to find a partner who can keep up with them that doesn’t smother or cling. They’re good natured, generous people and when conflicts arise, forgiving and making up can be so delightful it’s almost worth it. They can be best friends and madly-truly lovers who live life to the fullest. Life for a Sag couple can be destined, with a touch of serendipity being a normal occurrence. If they are drawn to be with each other, it is probably meant to be. They optimistically go through life expecting only good things to happen, and it often works out that way. Lucky you! Capricorn and Sagittarius are both dedicated people when it comes to their careers, but they are focused on their own individual quests in life, which can be very different from each other. However, there are areas where they complement each other nicely. Capricorn admires the Sagittarian vision and sense of freedom, and although Capricorn can find it difficult if not impossible, to let go and let live like Sagittarius can, they can if they hold on tightly to the centaurs’ wings, which allows them a little more freedom than they give themselves. Sagittarius has a great deal of admiration for the Capricorn business savvy and ability to bide their time to get what they what. They both look to the future, but unlike Sagittarius, Capricorn can get bogged down with the day-to-day level of responsibility, and therefore take a slower route up mountain while ensuring everything they have promised has been attended to. Sagittarius does not always have time for the details, they see an opportunity and go for it, and trust that all will work itself out in the end, magically somehow, and it does. These two communicate well on a superficial level, but when the conversation gets deeper, the topics they’re interested in can vastly differ, unless of course, their personal charts have a greater alliance with each other’s purpose and interests. They are fascinated by each other and there are lessons to learn from having an acceptance of the other’s attributes and a willingness to share. They follow their own missions in life and this can automatically divide them. At times, they can have an amazing, but fleeting connection, but mostly it is like they are in different zones and can’t get their mind, body and spirit to synchronize. Sag yearns to be free to explore the world and Cap has a need to have security and stability in life. Two free-wheeling souls with far reaching vision and idealistic convictions, Sag and Aquarius blend extremely well. 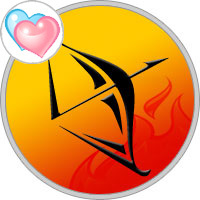 The fiery enthusiasm of Sagittarius warms the cool, intellectual air of Aquarius - their energies feed each other. Both are independent, energetic and passionately individual; they sync up beautifully on just about all levels – body, mind and spirit! Both have a touch of wildness and unpredictability, which they’ll find attractive and stimulating. They’ll forge their own paths and relate as kindred spirits, respecting each other’s quirks or idiosyncrasies. Good times, adventures and brilliant collaboration are virtually guaranteed. They share many core values and interests; social justice, the environment, human consciousness and the world of scientific discovery, philosophy, travel and the arts are interests they can join forces in exploring or defending. Aquarius admires Sag’s honesty and directness, and Sagittarius respects Aquarius’ brilliant, open minded intellect. They naturally give each other the personal space they both need, drawing strength and inspiration from their high-energy union. As a fixed sign, Aquarius is the natural leader of the pair, but Sagittarius is fiercely independent and won’t take well to orders of any kind. Conflicts that arise should be easily smoothed over, however, as these two resonate with an intuitive understanding. Their relationship may be unconventional from an outsider’s perspective, but they can find their perfect match in each other and couldn’t care less what others may think. A strong foundation in friendship underlies their relationship. They respect each other’s individual calling - if they know what it is. Both these signs are so curious about life itself that their personal journeys take some interesting twists and turns, but through it all they will support each other. An exciting match that can last a lifetime. There’s an intuitive and mystical connection between these two. The Sagittarius quest for truth complements Pisces inherent spirituality. Together they explore paths of higher learning in a spirit of adventure. There is an easy energy between them that’s almost childlike, providing lots of fun and frivolous activity. Sag has an upbeat, energetic approach to life that invigorates Pisces, who happily accepts the Centaur’s invitations to roam outside the Fishes’ habitual comfort zones. Sagittarius feels drawn to the old soul in Pisces, and each finds attractive qualities in the other that are distinctly different from themselves. Sagittarius enjoys a robust connection with their bodies; they’re often athletic in some way, which naturally appeals to Pisces, who are energized and excited by Sag’s physical exuberance. The Archer’s interest is piqued by Pisces sensual and mysterious beauty. Pisces compassion is touching to Sagittarius, and Sagittarius positive nature sits well with Pisces who doesn’t operate well around negative people. They have an expectation of idealism in life, and won’t settle for less!